Studio 54, 254 West 54 Street, NYC. Performances Tues, Thurs & Fri at 8pm; Wed & Sat at 2 & 8; Sun at 3pm. Despite an occasional misfire, tailoring some shows to a performer in a particular role can be a gimme. Dolly Levi and Mama Rose, for example, come with the territory. Lilli Vanessi does not dominate as do those. At least she didn't until Kelli O'Hara assumed the role in Roundabout Theatre Company's revival of Kiss Me, Kate” at Studio 54. The luminous, assured Ms. O'Hara sings the Cole Porter score so wonderfully, and plays Sam and Bella Spewack's book so adeptly that the show goes to soft focus when she's not on stage. Warren Carlyle's choreography and the ensemble charged with executing it are outstanding, and there are some fine supporting performances, which is the key word: it's in support of O'Hara. Those misogynistic particulars and the overall tone of Kate's (and Lilli's) subjugation have been re-interpreted and/or re-staged here, leading to considerable debate between traditionalists and pro-revisionists, among whom, as long as adjustments do not distort plot or character beyond intent, I count myself. Petruchio/Fred kicks (not spanks) Kate/Lilli's derriere, but she reciprocates in kind, and Kate's closing monologue, sung to Porter's lovely tune, is now gender-neutral. Having appeared in The Taming of the Shrew” and Kiss Me, Kate,” twice each, I applaud Lilli/Kate's emergence into the 21st Century. 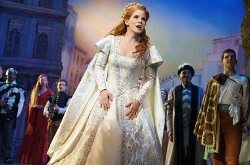 Kelli O'Hara as Katharina. Photo by Joan Marcus. "Kiss Me, Kate" was the first Cole Porter show with musical numbers that advance the plot, none more clearly than the curtain-raiser, Another Op'nin', Another Show. That adrenaline-rush sets the tone for what follows: a wealth of Cole Porter, including the gorgeous So in Love,” some songs with lyrics lifted from Shakespeare (Were Thine that Special Face”) and a couple backstage ditties (Always True to You in My Fashion”). I'm not sure if Will Chase lacks the baritone heft for Fred Graham, never mind Petruchio, or if playing opposite Kelli O'Hara makes it seem so. Either way, the pairing tilts the balance toward Lilli, and why not? It's been Fred's way for decades. 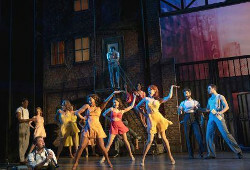 The Too Darn Hot” ensemble number that opens the second act is a joy, despite its incongruity. 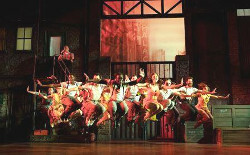 I mean if it's too darn hot to make love, this perpetual-motion chorus line would need mass resuscitation. Fortunately, they can catch their breathst during the prolonged cheering that greets its ending. Among other pleasures, count the staging of We Open in Venice,” which becomes more amusing with each repetition. Designer David Rockwell's multi-level backstage set is one on which you could even wait for the girls upstairs, and Jeff Mahshie's costumes, in and out of Shakespeare, are smashing. Scott Ellis's sweeping direction rounds it all out splendidly, while music director/conductor Paul Gemignani and orchestrator Larry Hochman make the Cole Porter score soar. Which brings us back to Ms. O'Hara, whose range, between the upper register of So in Love” and the lower of I Hate Men,” astonishes. (Simply stating I hate men” instead of drawing out the first three notes is a neat touch.) As Kate finally stands with Petruchio, so Lilli of course does with Fred; it is, after all, a love story. The difference is that here it is those women's considered choices. And never has a show's final image said so much about its leading role: As Lilli and Fred exit upstage, she holds the door for him to leave and then turns for a lingering look at the backstage area – and at us – as the light fades on her luminous face. Petruchio's description of Katharina, while playful, applies to Kelli O'Hara in full measure. She is beautiful, witty and affable, he has heard, among other wondrous qualities,” and he has arrived to make mine eye the witness of that report.” You might consider doing the same.